It is amazing the lengths some people are accused of going to, to get a job, including faking college degrees on their resume. But when doing that defrauds money from taxpayers it gets the State Attorney General’s office and I-Team 10 involved. and brain damaged patients. Part of his work got billed to Medicaid. The job required a college degree. Ross didn’t have one. So the State Attorney General’s office says he just faked it. 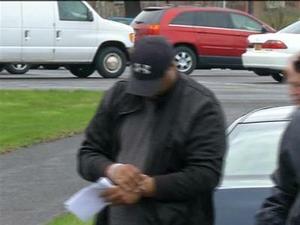 I-Team 10 was outside Webster Town Court when Ross was walked in to be formally charged with grand larceny. Ross tried to cover his face as he walked in. The state says he faked a diploma from the College at Brockport to get the Medicaid coordinator job at CDS Monarch in Webster. Because he wasn’t qualified to have the position he had, the state says every dollar charged to Medicaid through him was fraudulent. “The state would save millions if all that fraud and abuse wasn’t there obviously. The Attorney General’s office makes a big priority of prosecuting and weeding out Medicaid fraud especially in these times with state budget crisis,” Assistant State Attorney General Tim McFarland said. The state’s Medicaid Inspector General’s office is still crunching the numbers but so far they’ve found $87 million in medicaid fraud and abuse from last year. Now the budget deficit was $1.3 billion. Cut out fraud and abuse and you solve 6.6 percent of the deficit. Now — the issue of the fake degree. The I-Team talked to one expert who says there are 100,000 fake degrees sold every year in this country. “I think most people know exactly what they’re buying. And the reason is economic advantage. They’re looking for jobs, they’re looking for promotions,” said George Gollin, a Professor at the University of Illinois.